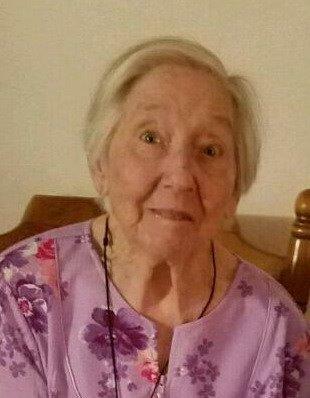 Services for Mary Beatrice Ginsel, age 84, of Grapeland was held at 1:00 P.M. Tuesday, January 31, 2017 at Felders Chapel Assembly of God Church with Rev. Randy Shipman officiating. Burial will follow in Parker Cemetery. Arrangements are under the direction of Bailey & Foster. Mrs. Ginsel died Saturday at Hospice Brazos Valley in Bryan. She was born March 10, 1932 in Phelps, TX. to Leonard Loving and Media Jane Garren Loving. Mrs. Ginsel was a longtime member of Felders Chapel Assembly of God Church. Bea as she was commonly known, was a housewife for many years until a new venture as joint ownership in a convenience store materialized. At this time she became cashier, stocker, bookkeeper, janitor, and any other position that presented itself. As a younger woman she was excellent as an embroiderer. She also lived on a farm and did many things in that role, not limited to but including canning, churning butter, feeding cows and chickens, picking watermelons, slopping hogs, planting a garden and the list goes on. She also loved to play dominos as well as play different card games. She spent many hours along a creek bank as well as in a boat fishing alongside her husband. She acquired the nickname of Granny Two Five from one of the grandchildren while jumping on a trampoline and was affectionately called that for many years. She will be missed by many. Mrs. Ginsel was preceded in death by her husband Norman Ginsel. As the result of her marriage to Norman Ginsel she acquired seven children. She is survived by four of those children, numerous grandchildren, great grandchildren, and great great grandchildren. She is also survived by one sister and numerous nieces and nephews. A special thanks to each one who visited her, called, or brought food. Your kindess is greatly appreciated. A special thanks to each hospice caregivers of Brazos Valley Incare in Bryan, Texas. Visitation was received from 11:00 to 12:00 at Felders Chapel Assembly of God Church before the service.